If you Walked, you walked to support and promote meat-flesh products. If you Walked, you walked to support lethal control of free-roaming animals. If you Walked, you walked to support of shelters who continue to kill unnecessarily. If you Walked, you walked to support puppy farming. If you Walked, you walked in betrayal of animals. The Million Paws Walk started more than 20 years ago, and was once the RSPCA’s “major national fundraiser”. At its peak it won the 2010 national “Best Charity Event” award and raised more than $2 million dollars for the organisation in a single day. "... The RSPCA Million Paws Walk is one of the nation’s most widely known and much-loved events. Since the very first walk in 1996, the event has experienced significant year-on year growth in participation numbers and fundraising income. In 2014 the number of walks across the country continued to grow, with 95 walks raising more than $2.1 million for animal welfare..."
However, in the last two years it seems the popularity of the Million Paws Walk has tanked with last week's event generating a little over $550,000, which probably doesn’t even cover the staffing costs to organise the day. So when other animal charities are reporting record donation hauls, why are animal lovers abandoning the RSPCA in droves? Last month the RSPCA came out swinging at No Kill, complaining that the existence of no kill advocates and shelters in Australia was making it hard for them to continue to fundraise and generate support from the community. Further reading - Is 'no kill' to blame for the RSPCA's failing reputation? And they weren’t totally wrong. The overwhelming success of sites like PetRescue.com.au and Facebook in helping No Kill shelters and rescue groups find and connect with adopters, has indeed meant that the RSPCA has been stripped of its pet adoption monopoly. In addition, the fact that No Kill organisation’s volunteers have demonstrated that they can save, rehabilitate and adopt out ‘special needs’ pets, when those same pets would be given a death sentence at the RSPCA, has forced the RSPCA to review its policies and start investing more in rehabilitation to counter negative community feedback. But probably most importantly of all, the old model of - ‘save some nice pets, kill the rest, collect a council cheque for disposal’ - has been rejected by the community as a suitable way for the RSPCA to operate. In response, the RSPCA has pulled out of several council pound tenders in recent history, reducing the number of impounds they are required to process. Nearly 40% less dogs entered RSPCA shelters in 2015/16 than did in the years around 2007. Further reading - What is the one key program saving lives at RSPCA shelters? So while the RSPCA blusters about the impact of these no kill shelters as being of detriment to pets, the overall outcomes for stray and homeless pets in Australia has done nothing but improve in recent history. Thanks largely to groups other than the RSPCA, and the community refusing to support killing. So while our love of pets and our desire to see their lives protected has grown, so has our compassion for all animals. Not just the ones we don’t eat. While in 1994 it was seen as "fine" for the RSPCA to host the Million Paws Walk and sell beef sausages and burgers to raise money for animal care, animal lovers are now becoming aware of the enormous contradiction this presents. It’s ok - we’re told - because all animals served at RSPCA barbecues were living under RSPCA approved conditions, before they were slaughtered and their corpses ground into lunchables. But in 2017 this clarification feels hollow. 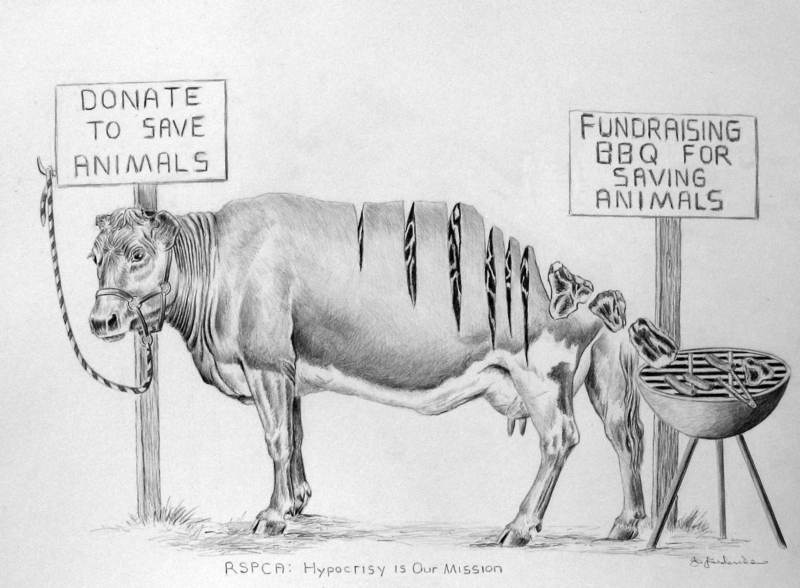 Even if we aren’t vegetarian, we don’t want our charity giving to hurt animals. The idea of RSPCA Approved meat products is another relic from more than 20 years ago, with the scheme starting in the same year as the Million Paws Walk. Based on the notion that the best thing we can do for animals in the food system is to allow them to live 'better lives' (before they have their throats slit or are bolted through the brain, and their dead bodies are chopped into bloody pieces). If we buy meat we might like the idea that the animal lived in a larger pen before it was killed. We might even pay a little more for these meat product (which, somewhat ironically, benefits the slaughtering industry). While no one can deny the program hasn’t been 'successful' by some measures - with a staggering 800,000,000 animals being bred and killed under the RSPCA Approved branding - the public don't invest our charity monies in dead animals. No matter how "good" we're told we're supposed to feel about it. If you’re the RSPCA and you’re going to work with farmers for your food accreditation program, then you need to align with farmers. At the very least, you can’t piss them off. Which is why the RSPCA has been so complicit, or actively non-active, in the protection of animals farmers traditionally need to cull in order to keep farming. When the Australian Wool Innovation joined forces with the Australian government to make a significant investment - more than $4 million dollars - in a new poison that could be sold to the public as safer and kinder to the target animals - rather than defend the rights of animals to live without being poisoned, the RSPCA “consulted”. This year a new poison Para-amino-propiophenone (short name ‘PAPP’) was approved for use. Further reading - Curiosity cat bait; what is it, and why should you care? The bait is made of ground up kangaroo (yes really) and farmers are now able to use it to target any predator which bothers their stock or is deemed to be damaging their production - namely dogs, foxes, dingoes and cats - and also by any local council who can’t be bothered with more targeted methods for managing stray animals. The poison is also known to kill corvids (crows), goannas and quolls. With up to 80% of baits taken by non-target species in trials. Also this year, a new virus was released that will kill most rabbits, including pet rabbits with no vaccination released. "How can you measure the humaneness of a pest control method"
“The RSPCA Australia has been involved in developing a model to assess the animal welfare impact of control methods and allow comparisons to be made between different methods. It provides a practical way of assessing humaneness that can be applied to any pest control method. And again, by focussing on ‘humaneness’ betrayed the animals, because a poison or disease we deem “humane” makes animals just as dead as one we deem to be “inhumane”, and as we’ve seen in the past, our ability to judge what is a “humane” death is often deeply flawed and limited by the technology of study at the time of our assessment. Remember when stuffing dogs into gas chambers was deemed ‘humane’ by the RSPCA? By refusing to stand up for the right to life for all animals, and acting as apologists for the farming industry by approving their killing of animals for meat products and those animals who might jeopardise the efficient farming of those meat animals, the RSPCA has driven away the animal lovers it needs to fund its operations. While the Million Paws Walk was once a bonanza of revenue, the real cash (ahem) cow was the sob story of the abused animal being saved by the RSPCA. And no greater emotional, tear-jerker exists than the puppy farm raid. Cute, fluffy, cold, miserable and neglected. It is powerful stuff. The RSPCA knows this, which is why puppy farm raids have been a staple of donation solicitation campaigns for as long as the RSPCA has been in business. But something happened in 2013 which would leave pet lovers aghast and show just how out of step with public opinion the RSPCA actually was. 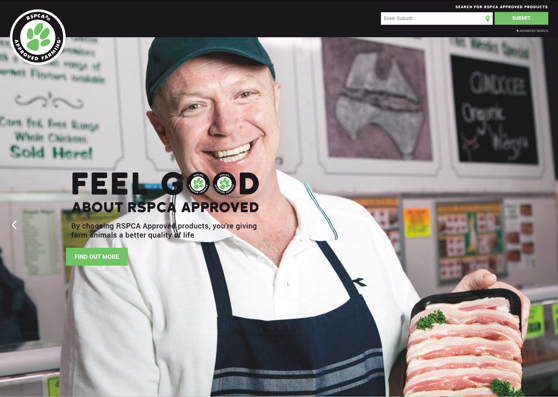 The RSPCA, believing that a replica of their approved meat program could help dogs being 'farmed', joined forces with the peak body for the farming of companion animals in Australia; The Pet Industry Association of Australia (PIAA). They claimed their program would help dogs by offering accredited puppy farms and retail outlets, assuring pet owners that puppies bought at RSPCA/PIAA approved pet stores were from a source that was ethical. Of course the program was a flop, with pet lovers crucifying the RSPCA’s stance than any farming and retail distribution of infant companion animals could ever be considered humane. It was another blow to the public’s trust that the RSPCA really reflected their own personal compassion towards animals. Sorry. We don’t have enough inspectors. Last month the RSPCA Tasmania complained of similar issues with animal investigations being been delayed due to the organisation being understaffed. Chief inspector Ray Kroeze said the RSPCA was struggling to keep up with the number of jobs. “At the moment we're just chasing our tails,” he said. In fact, the RSPCA provides - at most - 104 inspectors for the entire country of nearly 8 million square kilometres and 24 million human residents. If the RSPCA’s support of pound and shelters who kill pets, meat products and the lethal “pest” management programs, and puppy farming continues to drive away donors and supporters (into the arms of organisation who more strongly defending the rights of animals to have their lives protected) where does that leave the RSPCA inspectorate already struggling and understaffed? 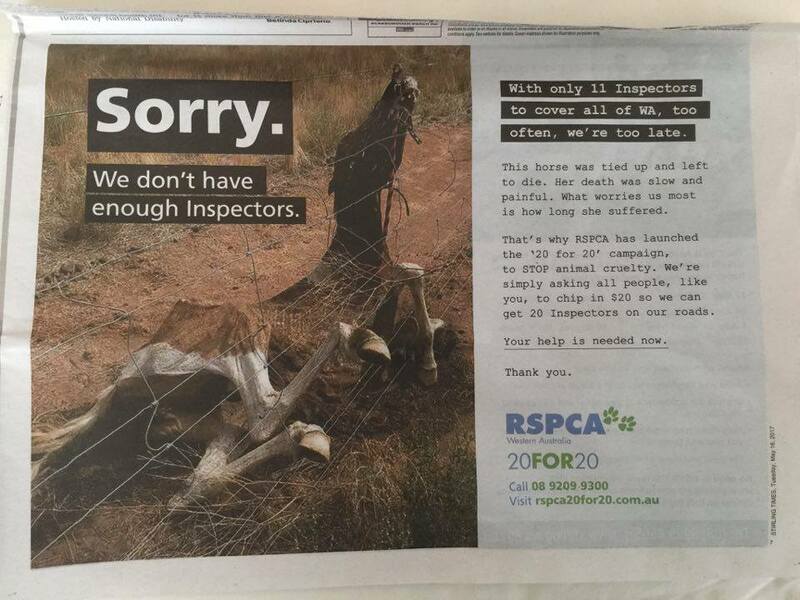 If the RSPCA struggles to raise funds because animal lovers don't feel represented and inspired to give by the organisation's policies, what happens to Australia's animal welfare legislation enforcement? What happens when no one Walks? The RSPCA is currently serving two masters - two masters who both have entirely different desired outcomes. The first is the animal production, farming and management industries who see animals as a revenue source, a food, an inconvenience and/or a resource. They desire to continue to keep using animals and killing animals to make a profit. While the second is the animal lover and pet lover - the supporter, donor, Walker, cupcake baker and often eventual estate-bequestor. The revenue these guys gift to the charity is what funds our animal cruelty legislation enforcement. That is, without charity giving to the RSPCA, there is no animal welfare law in this country. People donate to animal welfare charities because they want to see our most vulnerable animals protected - not to see their abusers and killers given an RSPCA stamp of approval. The RSPCA have made a massive, strategic error in underestimating how much people actually do care about the rights of animals to not be abused or killed. Even animals that are traditionally considered ‘unwanted’ or ‘surplus’ in the pound system. Even animals that are traditionally considered food. Even animals that are traditionally considered ‘pests’. All of them. All. Of. Them. This foundational error has made the RSPCA unsustainable. It has eroded community trust in the brand. And it has put our very animal cruelty legislation at risk. The chance of a complete strategic turnaround is practically nil, given the RSPCA has become so dependant on the revenue and industry relationships generated by their accreditation programs. The corruption inherent in a you-scratch-my-back program with animal producers has undoubtedly cemented the strategy for the foreseeable future. We need to stop letting a charity be our only real defence against animal cruelty. The only way our animal welfare legislation is not subject to the seasonal whims of charity giving, is for it to be a government funded, and considered as important as the police. An animal welfare enforcement agency that is neutral and removed from animal welfare advocacy or statement, but that has the sole mandate of enforcement of current laws and funded by the government, would allow the RSPCA to reclaim their role as champion for animals and allow the community to invest in positive social change instead of 'humane' meat. It is the only real hope that the RSPCA will stay relevant to the animal lovers in the future.